Many historic hotels are known for their grandeur and architectural significance, and you simply have to look up to understand the craftsmanship that went into creating these stunning places. Found in lobbies, ballrooms, and restaurants, these ornate ceilings and domes include some of the finest examples of stained glass, painted frescoes, ornamental plaster, stenciled wood, and gold leaf in the country. 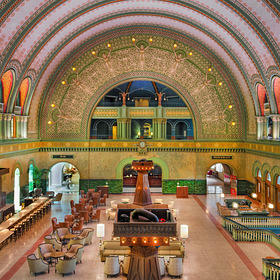 Check out a few of our favorite breathtaking ceilings and domes at Historic Hotels of America below. 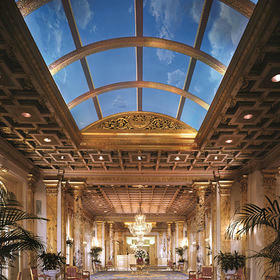 Built in 1912, the Fairmont’s gilded lobby ceilings were designed by Henry Jane Hardenbergh. The lobby murals, painted by Sunny Miller, depict sunrise and sunset. 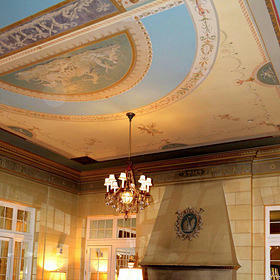 The hotel's original ceiling features cherubs and mythical elements in the Classical style. Located at Notre Dame's main building, just steps away from the Morris Inn, the golden dome is a centerpiece of the school's past and present. The dome was added to this building in 1882 and was most recently regilded in 2005. 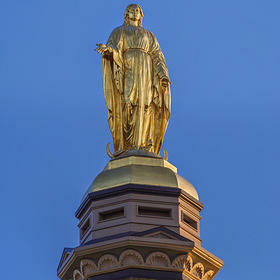 A 19-foot, 4,000-pound statue of Mary is situated on top of the dome—making the entire structure 187 feet tall. 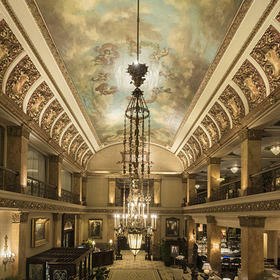 The Pfister Hotel and its iconic ceilings are 125 years old. First built as an open skylight and later enclosed and painted white, the hotel’s lobby ceiling was eventually hand painted with gold leaf. Sky blue scenes of cherubs positioned throughout the clouds recalls the original skylight. Often described as “Sullivanesque,” the 65-foot ceiling of Union Station’s grand hall lobby includes swaying flowers, bursting fireworks, and other dancing images, thanks to the hotel’s state-of-the-art 3D light show. Its magnificent ceilings were built in 1894. 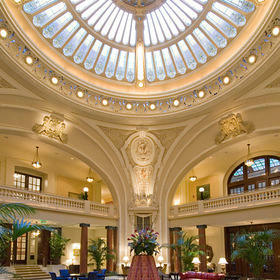 Inside the lobby of the Battle House is a stunning dome, over 42 feet tall and 63 feet wide. The dome’s Tiffany-style glass features fleur-de-lis designs, and more than 95 percent of the glass is original to its 1908 construction. The Menger’s Victorian lobby reflects its 1909 remodeling, designed by noted San Antonio architect Alfred Giles. Giles transformed the simple, utilitarian space into a much grander, Neoclassical style. A leaded skylight was added as part of these alterations, as well as eight Corinthian columns ornamented with festoons, garlands, and modillions (ornate brackets under the cornice of a column). When The Broadmoor was constructed in 1917, owners Mr. and Mrs. Penrose brought in over 100 Italian artisans and craftsmen to complete the hotel’s elaborate ceiling work. Italian Renaissance revival painter and interior designer John Smeraldi was tasked with painting the ceiling. 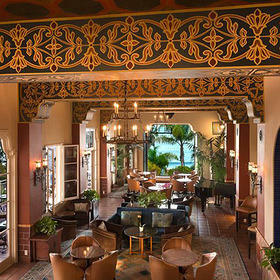 The original ceiling in La Valencia’s main building is reminiscent of Spanish royal crests and medallions. The ceiling’s panels, painted on plaster, are traditional mosaics in a deep terra cotta, and the “cement” cross beams are painted faux wood. 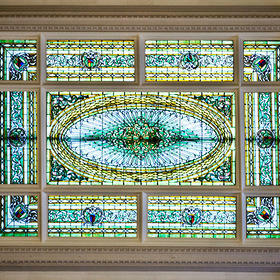 In 2014, the ceiling—along with the rest of the main building—was restored to its former glamour. Rich with architectural significance, cultural heritage, and historical ambiance, each Historic Hotels of America property has a story to tell. And once you stay, so will you.